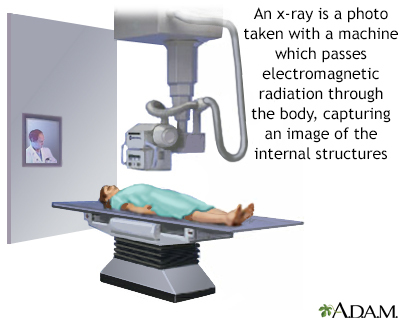 X-rays are a form of ionizing radiation that can penetrate the body to form an image on film. Structures that are dense (such as bone) will appear white, air will be black, and other structures will be shades of gray depending on density. X-rays can provide information about obstructions, tumors, and other diseases, especially when coupled with the use of barium and air contrast within the bowel.